One of the most important features of your nursery is a great chair, that will help you get your little one to sleep or just spend time with them. This nursery chair buying guide is designed to help you and your baby have a much better time together and a whole lot more. We’ve looked at several different options and we hope that you’re going to love each of these features. Material: There are several different types of material that your chair could be made of. It could be made entirely with wood or upholstered. It could be a mix of the two. This is going to be a personal preference issue. Style: The style of your chair could be a recliner, a rocker or something in between. Once again, the style that you actually want for your house and your nursery is going to depend entirely on your personal preference. Color: The color of the chair will likely depend on your personal preference as well as what your nursery actually looks like, but it’s going to be really unique and it’s going to help create the look of the room. Ottoman: Whether you want an ottoman or not is up to you. Some people like to be able to put up their feet separately while others want a chair that has an attached footrest. Some people don’t like footrests at all. Size: The overall size of the chair is going to be extremely important for your space. You want to make sure that it’s going to fit in the room that you have and that you’re going to feel comfortable sitting in it as well. Warranty: Is there a warranty on the chair? If there is it means the company stands behind the chair and you also want to be sure it has a long enough warranty that you can trust the chair to last for a decent time. Finding a chair that you’re comfortable with and that also fits great in your household is definitely an important step. Hopefully each of these chairs, and each of these nursery chair reviews are going to help you narrow down your options and make a decision on just what you want for the space you have. 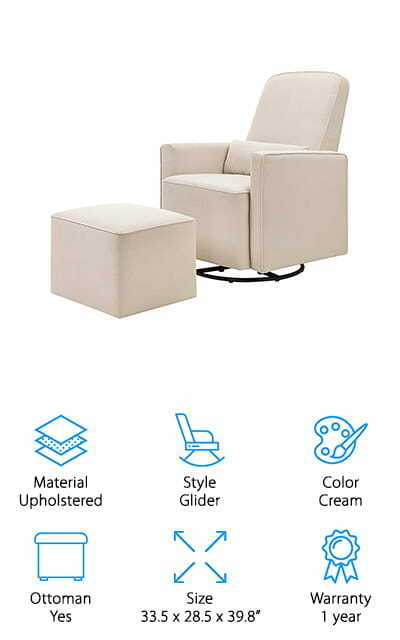 This swivel glider is one of the top rated rocking chairs for nursery and is a cute and comfortable option for your baby’s nursery or even for the main living area of your house. The gray color is a great accent and the seat even reclines and has a footrest. In fact, you can use the footrest partially even without leaning the east back or you can get a full recline. Either way, you can also get a little bit of a glide to help lull your baby to sleep. Not thrilled with the gray color? Not a problem, because you can choose from a total of 4 different colors. The button tufting and welt trim give it a stylish look while the sturdy construction and foam filled seat give you plenty of softness. Able to hold up to 225 pounds, this chair is also easy to assemble and has comfortable armrests to provide you with just the right level of support. 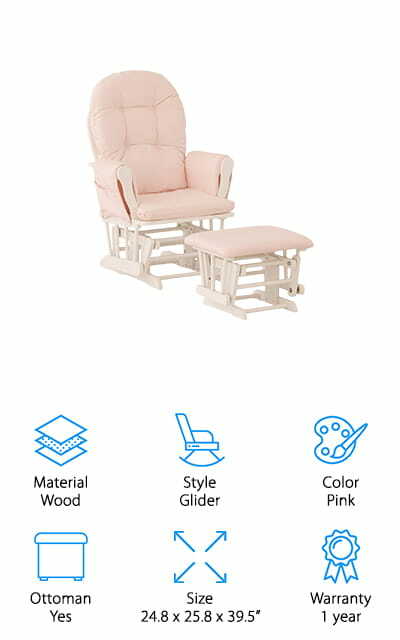 This cute little glider is one of the best cheap rocking chairs for nursery and actually comes in 15 different colors, so you can get something that you and your little one will enjoy, in any room of the house. It’s made with white wood for the frame to increase stability and durability and it has soft, gray cushions over the entire thing as well as the included ottoman. If you have any kind of stains or spots you can remove the cushions to clean them and you can even use the attached pockets to store toys, remotes or anything else you may need. Made with polyester, this chair gives you just the right amount of gliding ability and it’s inexpensive at the same time, which is why it’s our budget pick. It’s a moderate weight, so you’ll be able to move it around as needed, and it comes with a 1 year warranty. This upholstered nursery rocking chair looks sleek and stylish and it definitely is. 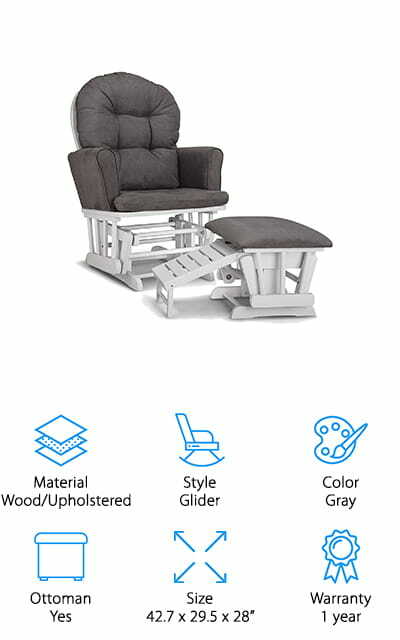 It’s also a glider and swivels, which means you’ll be able to get comfortable anywhere you want. There’s even an ottoman included, which lets you put your feet up after a long day with your little one. The cream color is elegant but there are other colors available as well if you’re looking for something that will match your room in a different way. Moderately priced, this chair has a high back and a lumbar pillow and it’s formaldehyde free, so you can feel comfortable putting it in your nursery. The metal base makes all of the movements smooth while the polyester fabric makes sure that you’re comfortable. Whether you’re resting with the baby or without you’re going to have no problem with this option for your next chair. 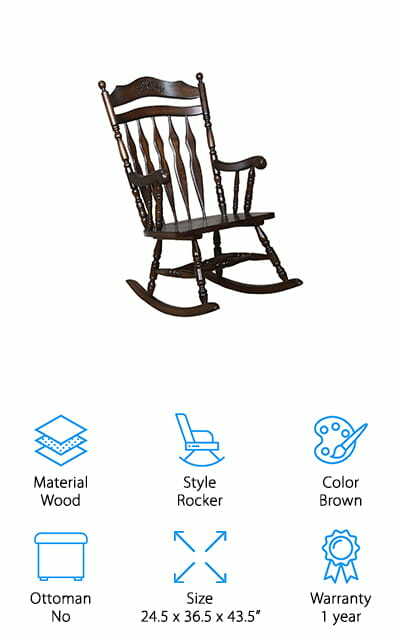 This traditional rocking nursery chair is made with a high quality Asian hardwood in a medium brown finish. What that means is you’re getting a durable chair that’s made of wood you can count on to last. It’s rated to 300 pounds and gives you the soft, gentle rocking motion that you’re looking for with your little one. The stylish design is simple, but definitely gives you something comfortable and it’s compatible with many pads and cushions if you want something a little softer. Moderately priced it’s made by a company well known for furniture and has turned arm and leg supports to make it even more durable. The traditional style makes it fit well in a nursery or in your living room or anywhere else you might want. 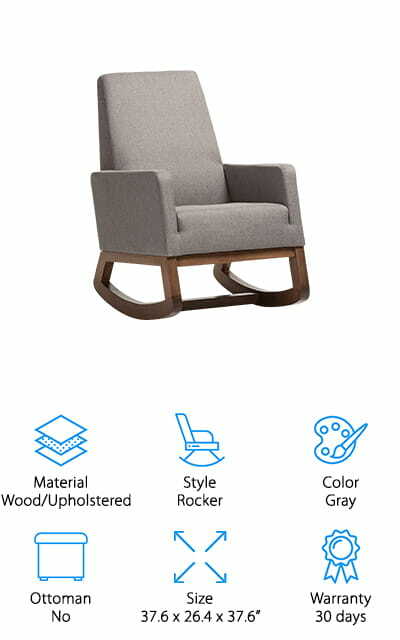 Available in several different colors, this moderately priced best rocking chair for nursery comes in a white wood with a gray accent for the cushions. You’ll get plenty of cushion all the way through the seat, back and arms as well as on the included ottoman so you can feel comfortable sitting and relaxing with your little one. You’ll also get pockets on the sides that help you store anything you might need including a book, toy, pacifier or even just a remote for the television. The chair itself is made with a wooden frame and has closed ball bearings to make it move smoothly. The material over the chair is also easy to spot clean in case anything gets spilled on it and everything you need to put it together is included in the box. Your nursery will definitely look ready with this cute pink and white nursery chair to rock your little one in. The white wood frame looks soft and sweet with the pale pink cushions to go over the chair and the ottoman but if you’re looking for a different color for the cushions or the wood they have plenty of those as well. In fact, there are over 60 different combinations to choose from. There are even pockets on the sides to hold anything you might need while you’re sitting there. Capable of supporting up to 250 pounds, this chair gives you a smooth gliding motion to help your little one get to sleep easier. It’s easy to spot clean so you can keep it looking great and you’ll be able to put the whole thing together quickly and easily. The company has been in business over 60 years and is well known for making children’s and infant’s furniture. This upholstered chair serves as a swivel and a glider chair with a gray color that’s stylish and simple. It fits into just about any décor, whether you’re looking for something in the nursery or something in your main living space. It has thick padding over the arms, the seat and the back and even has knife edge arms and piped detailing to get an even better accent. This heavy duty chair can swivel a full 360 degrees and does it quietly, as well as reclining backward quietly. That means you can get comfortable even when your little one is starting to doze off in your arms. 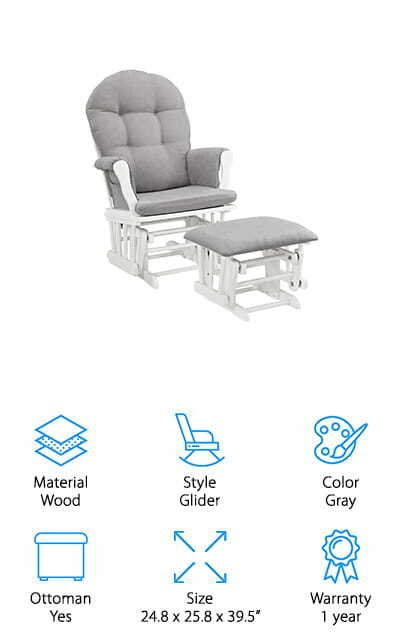 You’ll have plenty to love about this glider that’s made with a white wood and covered with gray upholstered fabric, though it’s also available in other colors if you prefer. 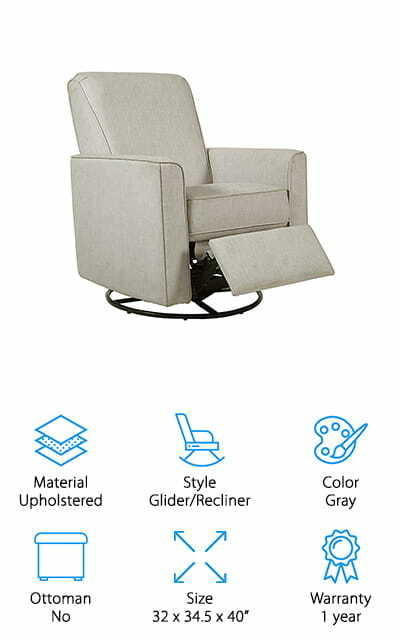 The glider comes with an ottoman, which also offers upholstery over the top and has a nursing pull out section to make it easier for you to get comfortable when you’re feeding your little one. 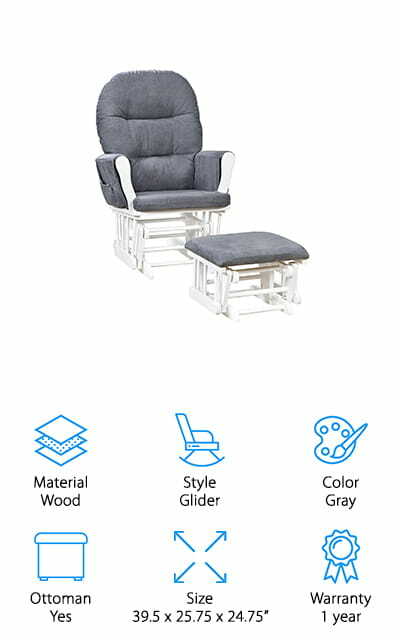 The microfiber cushions keep you feeling great and the company that makes this glider is one that’s well known in baby furniture. The chair itself is rated to 250 pounds and the sleek design is simple but still looks great in your baby’s room. 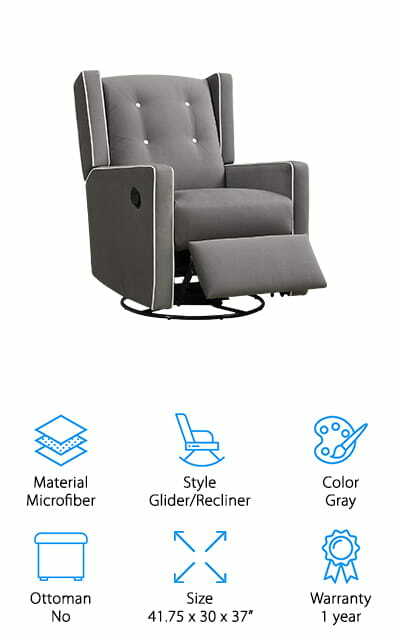 The bow back and the metal ball bearings on the glider and ottoman make it a whole lot easier for you to glide softly and quietly during feeding. 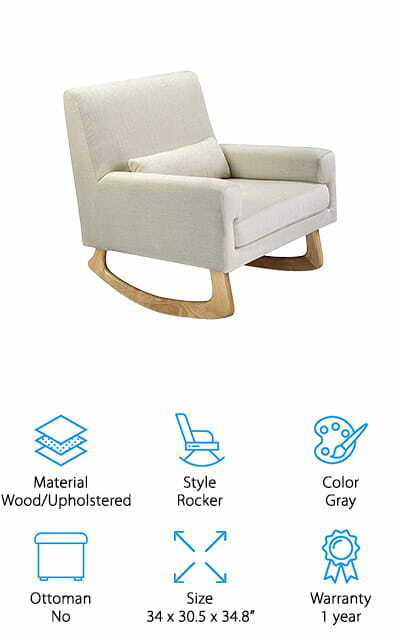 This rocking chair has a modern look that definitely adds something unique to your nursery. The wooden frame supports an upholstered rocking chair that has a sturdy backrest and armrests. It’s moderately priced and has a smaller footprint than traditional rocking chairs that you’ll find, which makes it a great choice for rooms that don’t have a lot of space. The walnut base and the ergonomic design of the rest of the chair make it a great choice and help you feel more comfortable, which helps your little one feel more comfortable. This chair is a little heavier than some other options, but that means that it’s sturdy and that you can feel safe using it during the day or night. You may not even want to hide it away in your nursery but keep it right out in the open where everyone will see. This slightly modern rocker gives you wooden legs for additional support and has an upholstered frame that keeps you even more comfortable. The lumbar pillow included adds more cushion and support no matter when you’re feeding or rocking. Constructed by hand, it uses ash hardwood for the legs and a polyester blend that’s hand upholstered over the top. It’s available in 3 different colors and can be cleaned easily if you ever end up with stains or spots. This oversized rocker is designed to keep you and your little one feeling comfortable when it’s time to rock them to sleep and takes up a moderate amount of space in your nursery. It has a light amount of padding, but just enough to make you feel great about using it. The prints are even made in the United States.